This article is about the tree growth. For people with the given name, see Burl (given name). For the British archaeologist, see Aubrey Burl. For the Killdozer EP, see Burl (EP). A burl (American English) or bur or burr (UK English) is a tree growth in which the grain has grown in a deformed manner. It is commonly found in the form of a rounded outgrowth on a tree trunk or branch that is filled with small knots from dormant buds. In some tree species, burls can grow to great size. The largest, at 26 ft (7.9 m), occur in coast redwoods (Sequoia sempervirens) and can encircle the entire trunk; when moisture is present, these burls can grow new redwood trees. The world's second-largest burls can be found in Port McNeill, British Columbia. One of the largest burls known was found around 1984 in the small town of Tamworth, New South Wales. It stands 6.4 ft (2.0 m) tall, with an odd shape resembling a trombone. In January 2009, this burl was controversially removed from its original location, and relocated to a public school in the central New South Wales city of Dubbo. Burls yield a very peculiar and highly figured wood, prized for its beauty and rarity. It is sought after by furniture makers, artists, and wood sculptors. There are a number of well-known types of burls (each from a particular species); these are highly valued and sliced into veneers for furniture, inlay in doors, picture frames, household objects, automobile interior paneling and trim, musical instruments, and woodturning. The famous birdseye maple of the sugar maple (Acer saccharum) superficially resembles the wood of a burl but is something else entirely. Burl wood is very hard to work with hand tools or on a lathe because its grain is twisted and interlocked, causing it to chip and shatter unpredictably. This "wild grain" makes burl wood extremely dense and resistant to splitting, which made it valued for bowls, mallets, mauls and "beetles" or "beadles" for hammering chisels and driving wooden pegs. 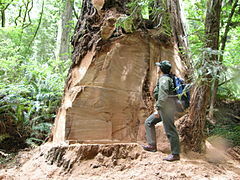 Because of the value of burls, ancient redwoods in National Parks in Western United States have recently been poached by thieves for their burls, including at Redwood National and State Parks. Poachers often cut off the burls from the sides of the trunks using chainsaws, which exposes the tree to infection and disease, or fell the entire tree to steal burls higher up. Because of risk of poaching, Jeff Denny, the state park’s redwood coast sector supervisor, encourages those buying burl to inquire where it came from and to ensure it was obtained legally. Legal acquisition methods for burl include trees from private land cleared for new development and from lumber companies with salvage permits. Amboyna burl is a particularly expensive type of burl, much more than bigleaf maple burl, for example. It comes from padauk trees (Pterocarpus spp.) of Southeast Asia. 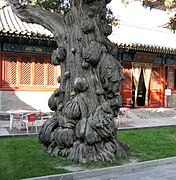 Padauk trees are quite common but burl wood is rare. The amboyna is usually a deep red, although the more rare moudui burl is the same species but the color is from golden yellow to yellow-orange. The sapwood is creamy white with brown streaks. The common use for amboyna is interiors for luxury vehicles, turnery, cabinets, veneer, and furniture. ^ Sloane, Eric (1973). A Museum of Early American Tools. New York: Ballantine Books. pp. 28–32. ISBN 0-486-42560-6. ^ a b c Brown, Patricia Leigh (April 8, 2014). "Poachers Attack Beloved Elders of California, Its Redwoods". The New York Times. Corbett, Stephen (2006). The Illustrated Professional Woodworker. London: Anness Publishing. ISBN 978-0-681-22891-7. Powers, Steven S. (2005). North American Burl Treen: Colonial & Native American. Brooklyn: S. Scott Powers Antiques. ISBN 978-0-9760635-0-6. James, Susanne (1984). "Lignotubers and Burls: Their Structure, Function and Ecological Significance in Mediterranean Ecosystems". Botanical Review. 50 (3): 225–66. doi:10.1007/BF02862633. JSTOR 4354037. Rankin, William Howard (1918). "Mistletoe Burl and Witches'-Broom". Manual of Tree Diseases. pp. 214–5. OCLC 1652501. White PR (April 1958). 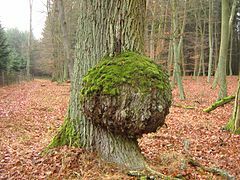 "A Tree Tumor of Unknown Origin". Proceedings of the National Academy of Sciences of the United States of America. 44 (4): 339–44. Bibcode:1958PNAS...44..339W. doi:10.1073/pnas.44.4.339. JSTOR 89803. PMC 335423. PMID 16590202. Zalasky, Harry (1975). "Low-temperature-induced cankers and burls in test conifers and hardwoods". Canadian Journal of Botany. 53 (21): 2526–35. doi:10.1139/b75-277. Funk, A. (1982). "Therrya canker of spruce in British Columbia". Canadian Journal of Plant Pathology. 4 (4): 357–61. doi:10.1080/07060668209501277. White PR, Millington WF (February 1954). "The distribution and possible importance of a woody tumor on trees of the white spruce, Picea glauca". Cancer Research. 14 (2): 128–34. PMID 13126948.